EXCELLENT OPPORTUNITY THAT DOES NOT REQUIRE A DEGREE! PASS‐ON TO SOMEONE WHO CAN USE THIS! Great jobs for young men who aren’t in college and strong young women also! This is Obama money for “infrastructure” …the jobs are located all over, paid training in Atlanta. This is an awesome opportunity, please pass this on. These jobs pay good wages. Track Worker‐030702 Job Summary: Work as a member of a crew to install new railroad track, maintain existing track and right‐of‐way. Replace or repair track switches with specific components. Slide and align tie plates. Drill holes through rails for insertion of bolts and tighten or loosen bolts at joints that hold ends or rails together. Correct deviations in track surface, alignment and gauge Cut rails to specific lengths etc. Pay Rate Entry Rate $19.36/hour Full Rate $21.52/hour Promotional/ Advancement Opportunities: Under Maintenance of Way Collective Bargaining Agreement, Track Workers may be considered for advancement or promotion to other positions within the Engineering Department if qualified. Qualifications: High School diploma/GED; 18 years of age or older; Valid Driver’s License. At CSX, two of the company’s core values are People Make The Difference and Safety Is A Way of Life. We are committed to offering our team members the most competitive compensation and benefits package available, unlimited opportunities for development and growth throughout an exciting and rewarding career, and the safest work environment possible. 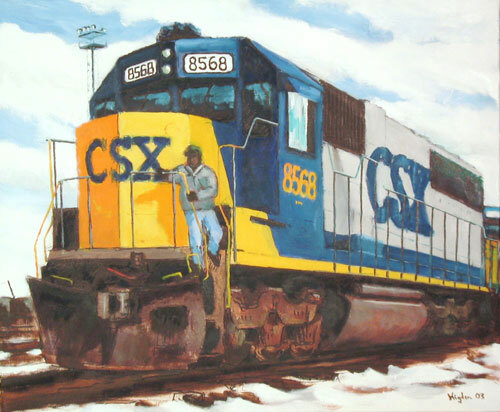 CSX is an Equal Opportunity / Affirmative Action Employer that supports diversity in the workplace.